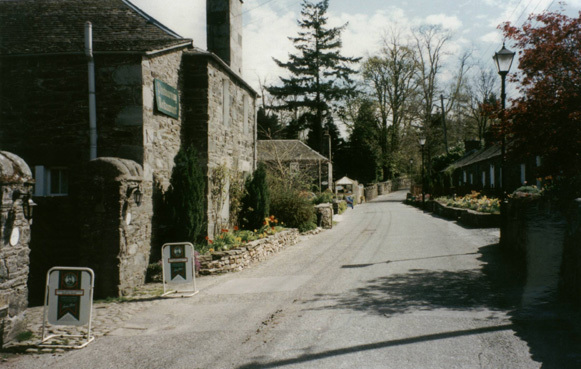 Pitlochry has long been a popular spot with visitors and as many like nothing better than a leg stretch in the excellent countryside around the Perthshire town, landowners and the local authority have banded together to create a series of marked routes. The trail through Clunie Wood is one such route and an ideal introduction to the beautiful Tummel valley with its craggy hills, rolling purple heather moorland and peaceful forest plantations. The walk leaves Pitlochry by a delightful pedestrian suspension bridge (feel it wobble in the middle!) 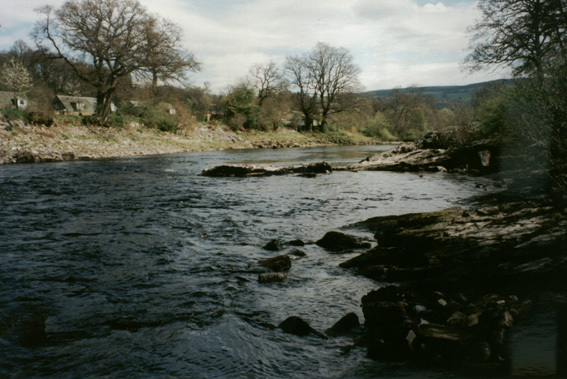 over the River Tummel, skirts by the famous Pitlochry Festival Theatre and strikes out into open country. Although predominantly pine and larch, the woodland boasts a fine mix of coniferous and deciduous species and if you go quietly you may spot deer grazing out with the main plantation or red squirrels scuttling over the high lichen-covered branches. Climb up to a mast at the top of An Suidhe and breathtaking views open out north to the high peaks above Blair Atholl and Ben Vrackie on the other side of Pitlochry. On the west side of the larger of the two Ferry Road car parks there is a walk information board and, next to it, an exit. Go through, turn left and a track leads towards a cottage (follow the Pitlochry Walks sign with blue and brown stick figures on it). Bear left before the cottage is reached and the way rises past a decorator's workshop into the trees. It skirts a cluster of caravans on the left then drops through oak trees to a road opposite a white bungalow. Cross and follow a tarmac path between houses on the right and a small stream and parkland on the left to reach a metal suspension bridge over the River Tummel,just downstream from Pitlochry's dam with its famous salmon ladder. Cross the bridge to Port-na-Craig and the path joins a road. Turn left and follow this up to its next junction. Cross and a minor road rises up on the other side (there are signs for Clunie Walk and Strathtay). Continue up and through a gate to reach the A9. Cross and on the other side a single track road continues up to Middleton of Fonab farm. Go straight on past a cottage further up to a gate and from there the track rises under a line of electricity pylons to enter woodland. In the trees, the track curves right to a locked gate. Don't go through this, but stay with the track as it swings left. Beyond the next right-hand bend, a path branches off to the left, signed for Clunie Walk. Pass through a kissing gate and a grassy path rises through the forest. It climbs for about half a mile to cross a forest track and continues up through the trees, leveling off to reach a crossroads. Turn right here and follow the track north west to a high kissing gate in the post and wire fence at the edge of the forest. The track curves steeply to the right, rising to a tall mast on An Suidhe, an excellent viewpoint. From the gate, a path heads out over open heather moorland. It can be indistinct in places but there are a handful of waymarkers to keep you on course. It runs north west for a distance before curving north east, following an old Pictish road down to the top edge of Clunie Wood. Cross a metal ladder stile by a high gate and follow the path down to the next junction. 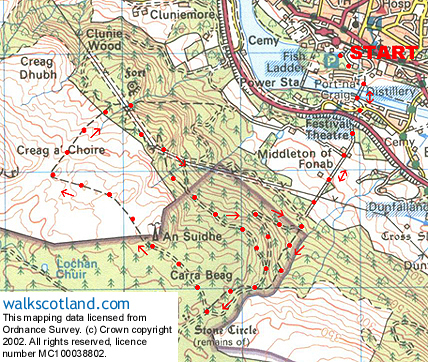 Turn right, following a sign for Pitlochry, and head through the trees to a clearing where pylons cut through the trees. Turn right here at a waymarker and follow the track to the next junction a short way on. Don't turn left here but continue straight on, following the pylons up the hill. The track curves right into the trees, swinging out to the edge of the plantation, then left back to the clearing. It passes under the wires before curving down under the line again and across a wide clearing. Follow the track on to the next junction. At another clearing, where a more modest line of overhead cables runs at right angle to the track, a junction is reached. Following the sign for Pitlochry, turn right up through a gate and the track climbs gently, joining a more substantial forest road a short way on. At a Y-shaped junction, turn left and the track curves down to a metal gate, with views over Pitlochry to Ben Vrackie to enjoy as you descend. Go through the gate and a few yards further on the track used earlier in the walk is reached. Retrace steps to the start from here. Map OS Landranger 1:50,000 sheet 52. Start/parking Ferry Road car park, Pitlochry (grid ref NN 938580). A parking charge is levied. Grading Track and path through forest with a moderately steep ascent early on. Care must be taken crossing the busy A9 trunk road in the early and latter stages of the route. For details of other walks in the area, pick up a copy of the Pitlochry Walks leaflet (50p) from the town's tourist information centre.